Often at the beginning of the year, we feel so full of life and energized with goals but then, one misstep and we feel like we've failed. I had a moment like that this week. I re-started my healthy eating plan on Monday and I was doing good, but on Tuesday night I found myself stuffing a handful of cookies in my mouth. Afterwards I felt like a complete failure. But messing up is not a failure, it's part of the process. I realized in the middle of my pity-party that being mad at myself and giving up after one mistake would be ridiculous. I didn't completely fail, I messed up. Failing would be giving up completely and never trying again. When I think of failure I think of something that is completely done and can't be fixed. For example, if I'm fixing dinner and I completely burn the meal to the point that we can't eat it, that meal has failed to be edible. It's done, it's over. But you're here. You clicked on this post and I'm guessing it's because you needed to hear that you haven't failed. Even if things have ended in your life or you've suffered big losses, you are still here ~ seeking, growing. You haven't given up on life or your dream, or that relationship or whatever it is you're pursuing. And that tells me that you're not ready to stop. You're moving forward. You may just need a little encouragement that you haven't failed. Most likely your problem is simply a misstep or a mistake ~ one that can be fixed. But even if it can't be fixed, you have a choice in this moment. You have a choice to move forward, to grow, to extend kindness to yourself and others. And that is never a failure. So please, be gentle with yourself and remember this: You have not failed, you're simply in the middle of your process. 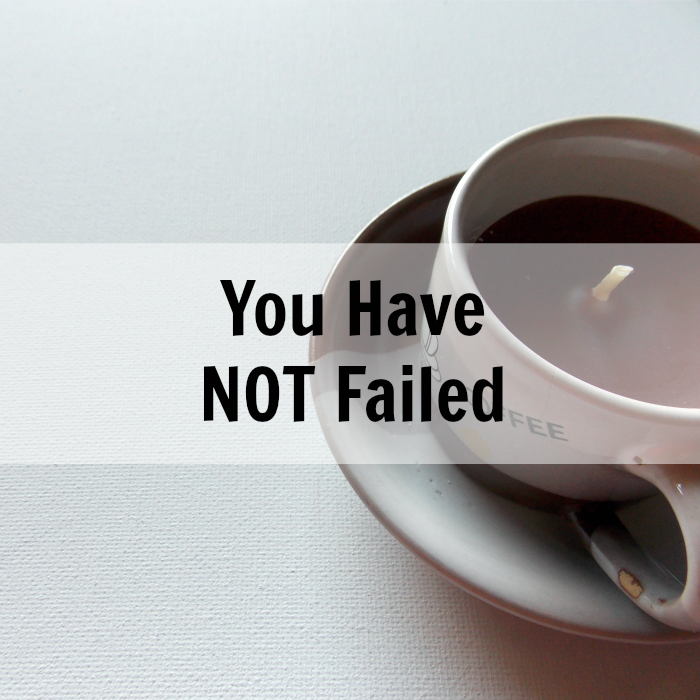 Are you worried that you've failed? Please tell me in the comments below so I can encourage you. Are you embracing your process? I'd love to hear how! Let's hold each other up. Beautiful and inspiring post, Catherine! Thank you for this uplifting reminder. I easily fall into the trap of thinking everything is a failure, but reading this post gave me one of those a-ha moments. I appreciate that! Jamie, I can be that way too! It's such an easy thought process to fall into. Thanks for sharing! I really enjoyed this post, Catherine. It really spoke to my heart. Wonderful wisdom you shared. I've been dealing with the same thing, trying to improve my diet and workout, etc. Thanks for sharing your thoughts! I was so happy to run across your post today, Catherine! I had a rough weekend facing self-doubt and a feeling of unworthiness. I came so close to quitting the pursuit of my art and writing dreams. Actually, did decide to quit, but my family and friends refused to let me give up! :) So there's nowhere left to go but forward, where I will focus more on how much I really do love the process. Thank you! Sending you a big hug, friend! Oh Sadee, that warms my heart! Don't give up ~ I'm a HUGE fan of your art and writing!! Big hugs back!